Traveling brings along lots of experiences. Tales to carry forward that you can tell others and for us, we surround those stories with food. The best part of those memories experienced is they can be refreshed when you encounter food similar to what you had during your travel to that particular location. 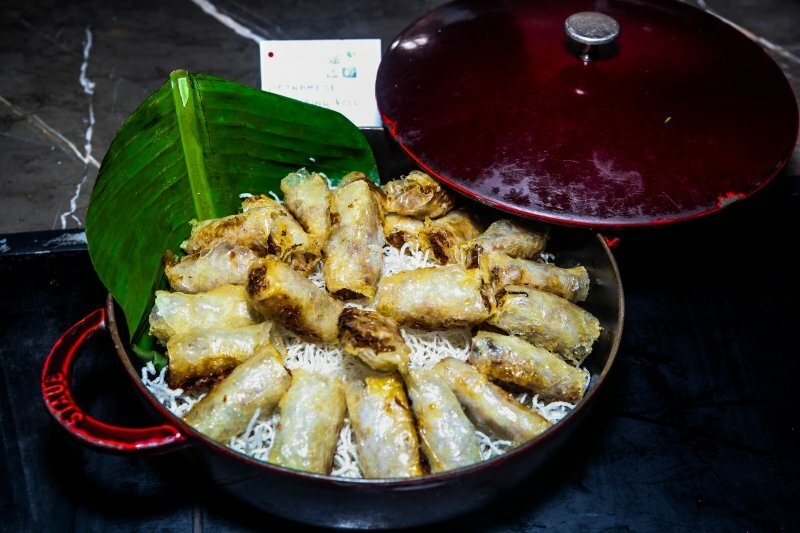 The ‘Vividly Vietnamese’ food festival at Westin Hyderabad did something of that sorts. A bowl of ‘Pho’ from the counter brought back a flood of memories of walking the streets of Hanoi Old Quarters, while sitting down on the small stools by the eateries and relishing some good old Pho. The lightness of the broth, the strong aroma of fresh herbs and subtle flavors was all that I needed for my fix at the Vietnamese Food Festival. Chef Nguyen Hung Thong from Sheraton Hanoi, who has a great deal of expertise on Vietnamese cuisine personally curates the entire experience. The stand-out dish at the #VividlyVietnamese food festival at The Westin Hyderabad Mindspace is the humble Pho. The broth packed a lot of flavor and the ingredients can be customised to your liking. Chef Thong Nguyen from Sheraton Hanoi has done a commendable job in putting out a fresh spread of Vietnamese to the already existing large one at Seasonal Tastes. Westin Hyderabad has always striven in bringing world cuisine on a plate at it’s all day dining restaurant Seasonal Tastes. There is something over there for everyone with an array of food ranging from Chinese, Indian, Live Wok and Grill Meat stations, Sushi and a huge range of desserts to end it all. But with the Vividly Vietnamese food festival I stuck to only the Vietnamese dishes on the menu. No doubt the Pho was a favorite among us but the one dish which quite took me by surprise was the Banana Blossom & Shredded Free Range Chicken Salad. The ingredients were fresh, crisp and yet artfully flavorful. The banana flowers and bean sprouts provided the crunch and freshness as to what was an outstanding dish. I think the dish is close to the Chef’s heart – he came numerous times to our table to inquire how we’d like the Banana Sprout Salad specifically and it had won our hearts. The salad station was my favorite place that day with the fresh Vietnamese Spring Rolls and Shredded Green Mango salad. What shall be Vietnamese without the classic Pork Spring Rolls and they find a special place on the menu as well. The Vietnamese Wok stations has a variety of options providing access to various choices of chicken, prawns, squid, beef or vegetable. There is also the steam station available too and the prawns are steamed to perfection. After having gorged on the salads and steam station, I kind of had a little bit off the Main course. The Grilled Duck in Galangal was tad chewy and the galangal flavor too hadn’t penetrated the meat. The Steamed fish in Soya sauce is light and soft as you slice through. The vegetarian section of the main course had Deep Fried Bean curd with eggplant and Vietnamese Wok Fried Noodles. As I made my way to the dessert counter, I particular dessert struck my eye. The shiny little cubes of traditional Green Bean cake. It is a simple cake but the Vietnamese hold it very close to the heart and I loved having it with a strong coffee during my travel in Vietnam. Small assorted fruit candies that Chef Nguyen had brought in from his country also featured on the counter. But you might skip almost everything but leave some space for the Chilled Longan which have been stuffed with Lotus Seeds and immersed in syrup. They are nice, light and a delightful end to a meal. Chef Nguyen has carried some of the spices, ingredients from Vietnam to make sure we experience the authentic flavors right here. The Vividly Vietnamese Food Festival is on at Westin Hyderabad Mindspace from 14th – 23rd August 2015. It is a chance to experience a unique, authentic and extraordinary cuisine in the city.